A stay at Motel 6 Brunswick South places you in the heart of Brunswick, a 4-minute drive from James Oglethorpe Monument and 5 minutes from Blythe Island State Park. This hotel is 16.7 mi (26.9 km) from Saint Simons Island Pier and 17.9 mi (28.9 km) from Driftwood Beach. Make yourself at home in one of the 65 air-conditioned rooms featuring flat-screen televisions. Complimentary wireless Internet access keeps you connected, and cable programming is available for your entertainment. Bathrooms have shower/tub combinations and hair dryers. Conveniences include phones with free local calls. This hotel has a convenient location off Interstate 95, making it the perfect stopover for passing through or visiting Brunswick and the Golden Isles of Georgia. This Brunswick, GA hotel is just two miles from Brunswick Golden Isle Airport. Additional area attractions include Emerald Princess II Casino, Colonial Mall, St. Simons Island, Jekyll Island State Park, the Federal Law Enforcement Training Center and Old Town Brunswick. The hotel provides business travelers with modern conveniences including free wireless high-speed Internet access, and the corporate floor features rooms with spacious work desks. There are meeting and banquet rooms available to accommodate most events and business functions with catering is available. 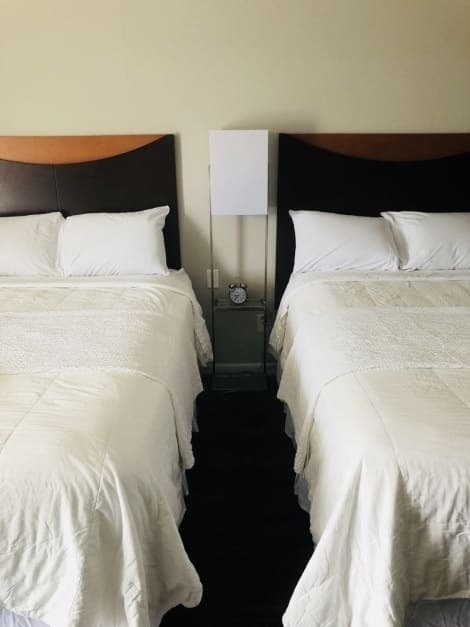 Each ample guest room includes refrigerator, microwave, hair dryer, coffee maker and cable television with HBO, and some rooms have whirlpool bathtubs. This is a 100 percent non-smoking hotel. Make yourself at home in one of the 52 air-conditioned rooms featuring refrigerators and microwaves. Complimentary wireless Internet access keeps you connected, and satellite programming is available for your entertainment. Bathrooms have shower/tub combinations and hair dryers. Conveniences include desks and coffee/tea makers, as well as phones with free local calls. Located in Brunswick, Motel 6 Brunswick, GA is within a 10-minute drive of Glynn Place Mall and Selden Park. This motel is 14.4 mi (23.2 km) from Saint Simons Island Pier and 24.5 mi (39.4 km) from Driftwood Beach. Featured amenities include a 24-hour business center, express check-out, and a 24-hour front desk. Planning an event in Brunswick? This hotel has facilities measuring 400 square feet (37 square meters), including a conference center. Free self parking is available onsite. Located in Brunswick, Baymont by Wyndham Brunswick GA is a 2-minute drive from Glynn Place Mall and 7 minutes from Selden Park. This hotel is 11.1 mi (17.9 km) from Saint Simons Island Pier and 20.6 mi (33.2 km) from Driftwood Beach. Make yourself at home in one of the 146 air-conditioned rooms featuring refrigerators and microwaves. Complimentary wireless Internet access keeps you connected, and cable programming is available for your entertainment. Conveniences include desks and coffee/tea makers, and housekeeping is provided daily. Grab a bite from the grocery/convenience store serving guests of La Quinta Inn & Suites Brunswick. A complimentary continental breakfast is included. lastminute.com has a fantastic range of hotels in Brunswick, with everything from cheap hotels to luxurious five star accommodation available. We like to live up to our last minute name so remember you can book any one of our excellent Brunswick hotels up until midnight and stay the same night.